Sometimes Mondays are the ones that we dread. You know, the ones where we get up late. You spill coffee on your favorite blouse (if you even get coffee). You forget a report, a document, or a paper you need to turn in for work, school, or… I could go on and on. We have all had those days and we know what they ate like. You can fill in your own example of your less than stellar Monday. Mine is currently underway, so I take a deep breath and think back to my Saturday. Saturday was fantastic. On Saturday I had a great day. Around noon I went to an appliqué class at my local quilt shop (Stitch ‘N Quilt). If you remember I wanted to take an appliqué class because there were a couple of quilts that I wanted to make which had beautiful appliqué borders. Also during my Greater Atlanta Quilt Shop Hop, at one of the shops they had appliqué’s their name on a pennant hung inside. So when I saw that a class was offered, I signed up. The first thing we did after arriving at the class was to set up our machine. Next we received a handout from our instructor which we went over. We talked about the different kinds of appliqué. Some are raw edge, needle turn, and invisible. We were doing raw edge in our class. Next we went over some of the fusible products to choose from. Some are wonder under, steam a seam, and heat n’ bond. I purchased steam a seam to use. Our instructor cautioned us to not crease the fusible, and to keep it away from humidity, both of which can cause the glue to separate. Next she explained that when we trace a design in the paper side of he fusible, the image is reversed when it is placed on the background fabric. This is important to remember when dealing with letters, and when items on your design need to face in a certain direction. Some designers give you the pattern with the image already reversed so check closely. Trace each part of your image separately on the paper side of the fusible. You should leave a little distance between the traced image and the drawn design. If you leave an allowance it will make ting the image from the appliqué fabric much easier. Once your image is fused, then trim exactly to the pencil line. The handout and the instructor went on to discuss needle and thread, stabilizers, and specialty feet. (* Get an open toe foot.) I didn’t have time to order one before my class and I really wish I had. After going over the information from the handout she had us do some practice stitches. If you remember from a previous post I was having issues with my machine. As of late it wasn’t changing stitches and it seemed to have a short of some kind. Well the short issue hasn’t shown up again lately, and my instructor flipped a dial on my machine that regulated the stitch length (she moved it from zero). It was my duh moment! I hadn’t realized that’s what the setting had been on. So that was taken care of. For me the class paid for itself right there. We started off doing test stitches. This allowed us to see what our stitches looked like. We change the stitch for example Zig zag. We adjusted the length, length, and tension to one. We made several stitches then we went to two and sewed some stitches and then on to three, etc. After we were done we chose the settings we liked best for our appliqué project. I chose the zig zag stitch, my width was 3 and my length was 3. I think my tension was 2. After that we were set loose ton practice “for real “. 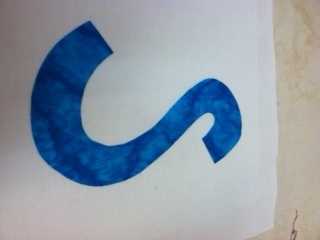 I sketched out a quick S. reversed it and transferred it to my fusible paper. Trimmed it a bit leaving a 1/4 inch to the edge, and transferred it to my blue batik cloth. Then trim the image out to he pencil line. Next peel off the paper and attach it to the background cloth you are using. Press it with an iron and then voila you are done! It was really quite easy. Now I only have the time issues to deal with so I can create my TWISTY STITCHES banner. This entry was posted in Sometimes Mondays are The Ones That We Dread and tagged appliqué, clothing, diy, GA, georgia, Quilt, quilts, sewing, sewing quilts, shopping, Stitch 'N Quilt, Stitch 'N Quilt in Mableton, style, transportation. Well our day started off as a success. Our trip took us near Charlies (a small store off of 166). I love stopping there when I get a chance so I can grab one of their fantastic Southern Biscuits. I chose the Sausage and Egg and Christopher had Bacon and Cheese. Let me tell you they were great and the lady that made the biscuits was very nice. Yum-Yum! Feeling good and ready to shop. Our first stop was Quilts and Fixins, in Jonesboro Georgia. I was super excited as this was our first store and I forgot to take photos. I got my passport stamped. Entered the drawing for the shops prize which was a large wooden thread holder. I remember buying a couple of patterns. Everything was bright and cheerful and it was a great first stop. Intown Quilters in Decateur Georgia. This was a nice store. Really cheerful. I liked the penant hanging from the ceiling with their shop name spelled out. I would like to do something like that in my office. Plus it would give me a chance to work on my applique skills. Hmmmm. Sounds like a to do blog project. They had some cute Doctor Seuss themed cloth with a variety of items made from it. This bag was really cute and quite simple. This store carried a really good selection of patterns for all kinds of projects. (I especially liked their clothing ones and their purse patterns.) I really had to control myself. I think that this shop had a quilt in their window that I really liked. The cloth had squares that could cut out and it looked like vintage valentines. They had cut them out and assembled them with other valentine theme material and made a really cool wall hanging. I remember taking a picture but facing the sunshine in the window you couldn’t see the quilt. Our next stop was Little Quilts in Marietta Georgia. This was the shop we stopped at a week or so ago when we were in the area. I really liked this shop. One thing they had was this cloth that looked liked vintage seed packets. They were assembled into a wall hanging. This store has some cute doctor Seuss cloth, patterns, purses, books, cloth. The space is a little tight but it is just crammed full of awesome things.The ladies are always super nice and it is a pleasure shopping there. Next stop was Tiny Stitches in Marietta Georgia. One thing that I liked at this store was their game quilt. It had checkers, tic tac toe, a bean bag toss, and a couple of others. I also liked their I spy quilt and the small quilt made with Nancy Drew book covers. Almost done only 2 more stops. The next shop was one of my favorites. Red Hen Fabrics in Marietta Georgia. This shop had a lot of cloth. All kinds of patterns and colors and themes. They had a lot of panels as well. I liked the snowman Christmas panel. I don’t know how I missed buying that one for the store. The presents and gingerbread cookie table runner was super cute. Only problem I have never appliqued. Again I am going to have to work on that. Rudolph was super cute. He is made with pinwheels. They tilted them and changed colors to make him. Very clever. This shop is the closest to me as it is in Mableton Georgia. They have a very nice shop filled with beautiful cloth. Lots of projects on display. All in all I feel that the Greater Atlanta Quilt Shop Hop was a successful. In a lot of ways it was like a professional conference. I visited a lot of shops, saw a lot of projects, got some good deals, met a lot of my fellow quilters, and I came back home ready to create. Visit my website at http://TwistyStitches.biz to see the photos that we took. This entry was posted in Uncategorized and tagged arts and crafts projects, bacon and cheese, clothing, quilting, quilts, sewing, shopping, southern biscuits, style, yum yum.